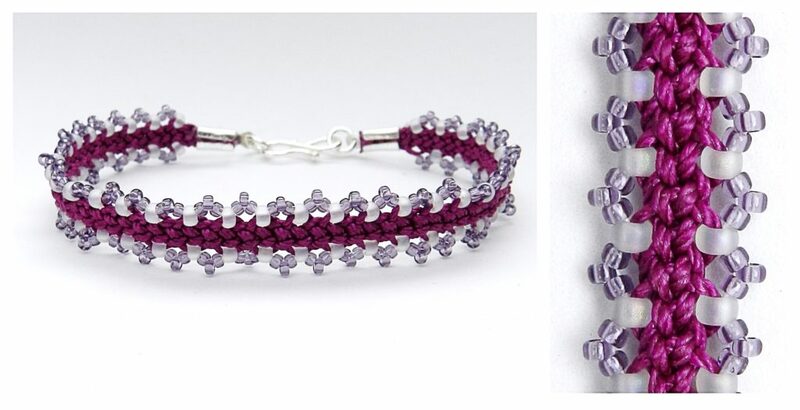 The second kit of the sterling silver show on 24.11.16 featured coated Amethyst rondelles, Amethyst 6mm rounds, and seed beads size 8 and 11 together with silver heart charms and silver 2mm rounds. It also included S-Lon cord in all 3 widths and a kumihimo finding kit. To watch the show click here. The demonstration starts at around 3 hours 18 into the show. 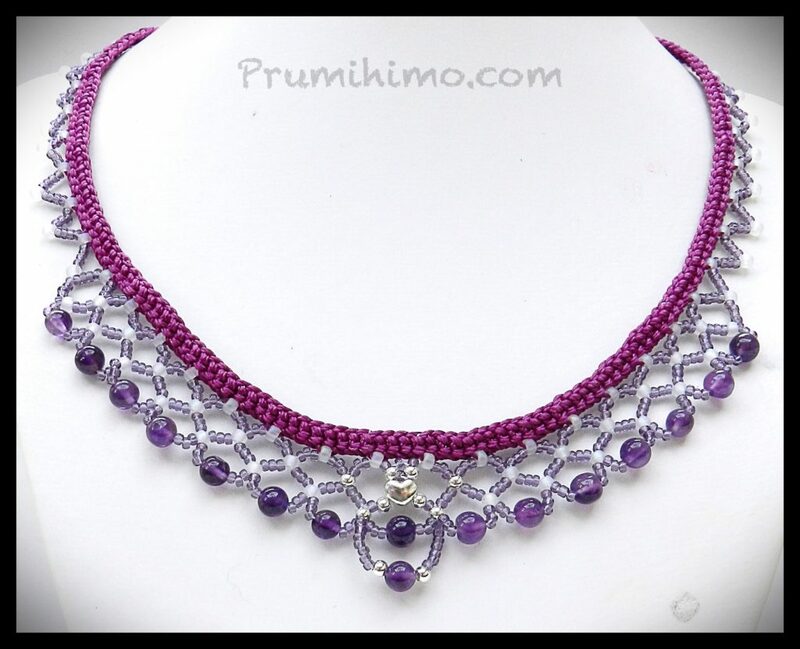 This hybrid kumihimo/beadweaving design was demonstrated on the show, but the time available was cut back, so it was a little rushed! This is a complex design, so if you have not done any beadweaving before it may be better to try the Half Round bracelt first. Cut 8 x 1m S-Lon 0.9mm. Position the cords on the disk on either side of the dots. The braid structure is Half Round Braid. Braid for 2cm. Thread 42 seed beads, size 8, onto the cord below the east dot. Continue to braid, adding in a bead every time the cord carrying the beads is moved from below the east dot to the top right slot. The cord will move around the disk, but do not add in a bead from any other moves. The beads will form along one side of the braid. Braid to the end of the beads and braid for a further 2cm. Thread a beading needle with thread and secure the thread in the braid by sewing through several times. Use the beads on the braid as the anchor points for the bead weaving. To make these instructions easier to read I will refer to the colour of the bead used. The white beads are the size 8 beads and the purple beads are the size 11 beads. Look closely at the photo to keep track of the pattern. Now start the main part of the beadweaving. The stitch is netting, which is a series of loops, joined to form the net effect. In this design the white beads are used as the joining beads. Important – check that the beadwork sits correctly. The tension of braiding has an effect on each braid and may cause the beads on your braid to be slightly closer or further apart than mine. Adjust the number of seed bead used if necessary. For the centre of the necklace some of the white beads were substitued for silver beads and a heart charm, but I recommend trying the design first without these substitutions. Once the technique has been mastered it is easy to make substitutions. Once a total of 15 loops have been stitched repeat steps 6-8 in reverse order. Reinforce the beadweaving by sewing through all the loops again, following the original thread path. 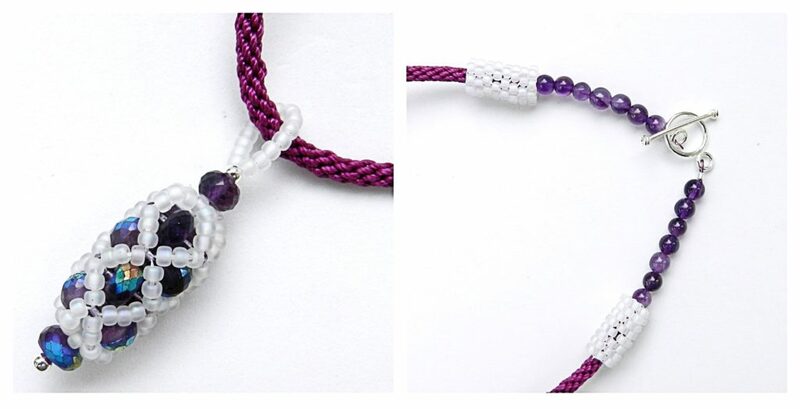 Join the first and last loops to the sides of the necklace with a row of 4 beads. Cut 8 x 60cm S-Lon 0.9mm. The braid structure is Half Round Braid. Braid for 2cm. Thread 30-36 size 8 beads onto the lower cords at east and west. Braid in a bead each time these cords are moved from the sides of the disk up to the top 2 slots. Do not add in a bead at any other time. Braid in all the beads and then braid for a further 2cm. Thread a needle with beading thread and secure the thread in the braid by sewing through the braid several times. Pass through the first bead on the braid and pick up 3 size 11 beads. Pass through the next bead on the braid. Repeat the added 3 beads along both sides of the braid. Reinforce the beading by sewing through all the added beads again. Omitting the middle bead of the three will create a perkier, more triangular shape. 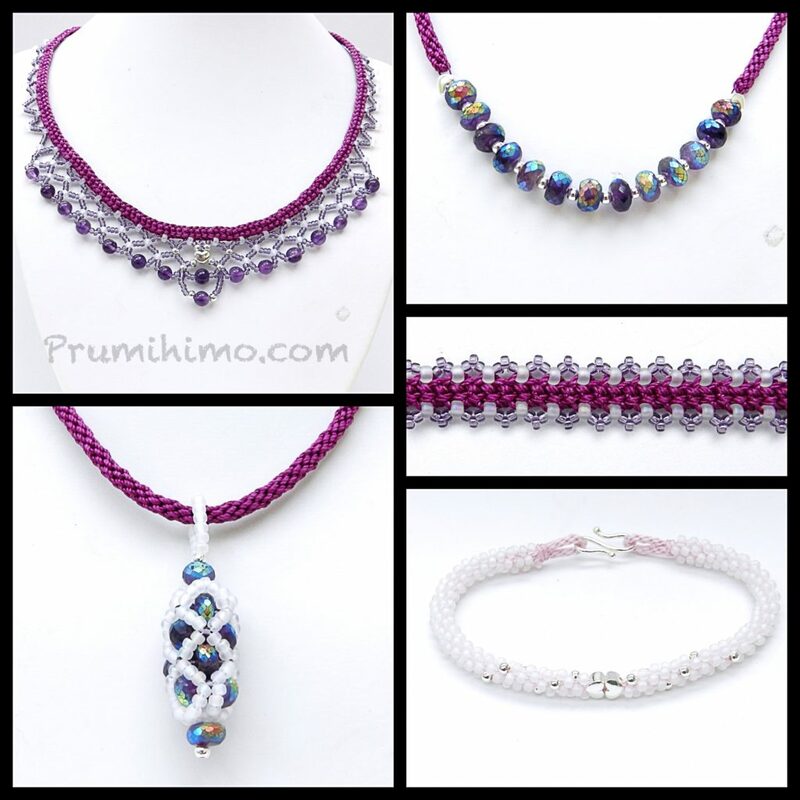 If you have the Prumihimo disk you can try similar designs, such as the Ophelia bracelet. 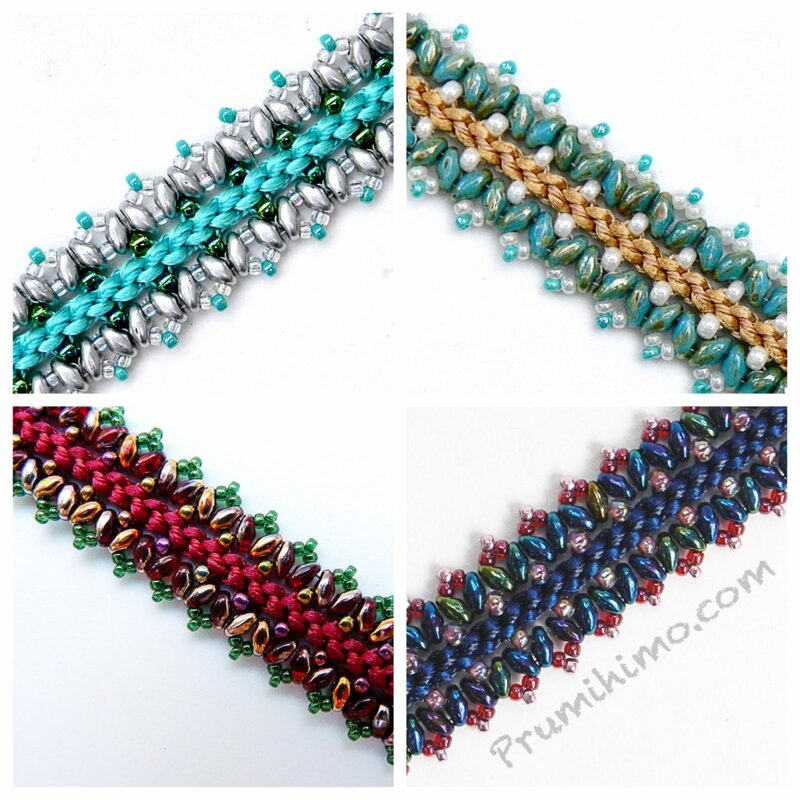 This is a great way to use larger gemstones with kumihimo. Thread a row of beads onto beading wire and crimp both ends with a small loop. Cut 4 x 70cm S-Lon 0.9mm. Thread the cords through one loop, centre the loop on the cords and position the cords on the disk. The braid structure is Round Braid. Repeat for the other side of the necklace. I demonstrate the netting method in a YouTube video, which can be watched by clicking here. This pendant was finished off with a loop of size 8 beads to form the bail. Make sure that the pendant is threaded onto the braid before the braid is ended off. A tube of peyote stitched size 8 beads is used to cover the ends of the braid. Cut 7 x 60cm S-Lon 0.5mm. Knot the cords in the middle. Thread one heart charm onto the cords and press it close to the knot. The braid structure is 7-cord braid. Position the cords on the disk and braid for 14 individual moves without beads. Thread 20 size 8 beads onto 6 cords. 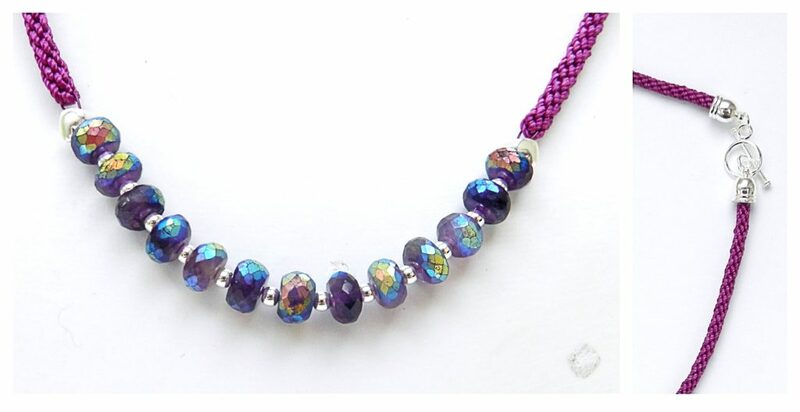 Onto the 7th cord thread on the following beads – 7 silver beads and 13 size 8 beads. Braid in all the beads and braid for a further 3cm without beads. Remove the braid from the disk and thread the second heart onto the loose cords. Press it close to the knot and position the cords on the disk. To form the fastening, bend the end of the braid into a loop and wind the free cords around the braid, close to the beads. Use a needle to stitch each cord into the beaded section of the braid. Repeat for the other end and use an S-clasp to join the loops.